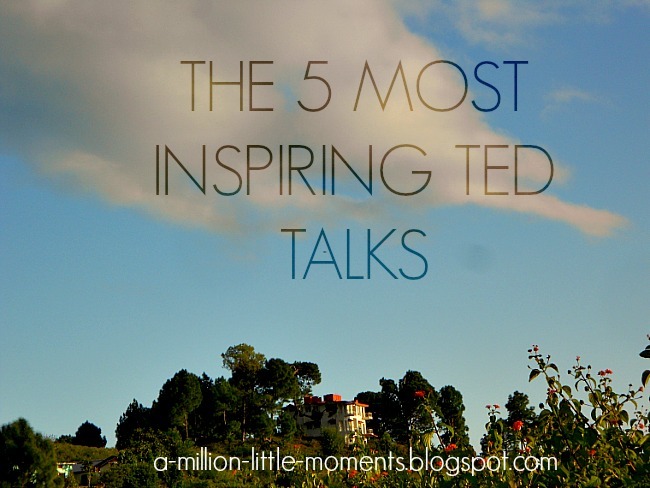 WANDERLUSTRIC: The 5 Most Inspiring Ted Talks. The 5 Most Inspiring Ted Talks. Ted Talks share some of the most amazing,inspiring and encouraging stories that this world has to offer. Suddenly the world feels a lot smaller and a lot bigger at the same time. You have to watch at least half of these videos. They are life changing,i promise you. I was first introduced to Ted Talks by my school as they would order assemblies just to share some of these talks and i couldn't be more grateful. Being exposed to the real world at an early age is not a bad thing! Bad things happen to good people and majority of your life is uncontrollable. Instead of hiding your children away from this world you should start to unmask all that you can and prepare them for life. Please do watch these videos, you won't regret it. They are truly some of the most truthful,inspirational and eye opening videos out there. 5. Nick Vujicic - Overcoming Hopelessness. Nick Vujicic is now a 32 year old man and is without a doubt one of the most inspirational men ever. His faith and determination is truly amazing. He was born without any arms or legs, but that didn't stop him from doing anything that people told him he couldn't do, he now has a son and he and his wife are expecting another baby soon. He starts the speech with a very simple goal, he wants to teach us how to travel. He ends up teaching everyone so much more. He teaches everyone about the kindness of people, wake up calls and the power of a smile along with a lot more.This is an absolute must for anyone who wants to travel, travels or is feeling lost confused and alone. This is the perfect kick start speech you needed. It literally pushes you towards your dream. She explains how to change your future into your dream in 3 simple and bold steps. I'm not going to tell you what they are because i truly think that you should give this one a watch. It's also quite short compared to most Ted Talks being only 10 minutes long, but i can promise you that each minute is jam packed with inspiration. 2. Mel Robbins - How to Stop Screwing Yourself Over. She's hilarious and everything she says is 100% right. She mainly focuses on living your life in autopilot and how to stop doing it. Some of the things she says are incredibly eye opening and really makes you think that you actually belong here, and you have a bigger purpose. This one is a must watch for anyone feeling stuck or down in the dumps. 1. Cameron Russell - Looks aren't everything, Believe me, I'm a model. Cameron Russell answers the most basic, obvious and common questions she gets asked but with a twist, she's 100% honest. If anyone is feeling insecure or dealing with body images because you've been comparing yourself to pictures of women in magazines and billboards, this is the video to watch. You should definitely watch this video at least once ( I've seen it several times, it's that good. ). I truly hope that these gave you some much needed inspiration! What i like to do when i find articles like these online is to watch one of each videos every day, so that these will last you for a good 5 days. I tried to keep the topics vast, and i tried to make sure that they dealt with the most common issues and problems people face during their day to day life.Them being - Hopelessness, Insecurity, Confusion about your future, The reasons to Travel and feeling stuck and bored with your life. Please do leave us a comment below or share our post, it means the world to us! I'm incredibly sorry that we haven't been posting as much. We actually have a whole list of posts to post ( hahaha) but we've just been having some issues with the website and how we want it to look. But i promise you that this won't be happening any more as I've come up with a schedule. So we will post every second day so that you get about 4 posts per week!